Igor Mazurenko noted that a lot of work is being done in Rostov-on-Don and thanked Ivan Dobrorezov, who will head the PAL’s representation, for his efforts to develop our favorite sport. “Now Rostov-on-Don can be considered the capital of professional arm-wrestling in Russia,” said Igor Mazurenko. Sergey Akulov: “Today there was a long-awaited event. We did a lot of work with Ivan Dobrerezov. Behind our shoulders - the big “IAMSPARTA” Tournament, the “Sparta Armwrestling Challenge“ series of tournaments. Also our big friend, Abdul-Rashid Mitrishchev, held a great “Storm” tournament in the Volgograd region and came to visit us at all the tournaments. In the process of negotiations, we decided to unite our forces to develop the League. 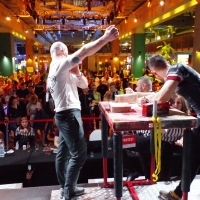 The goal of all that we are doing is to organize events at the highest level for all active athletes and to give them the opportunity to compete in the big arena, participate in the United Professional Armwrestling Rating and get qualified for the “Zloty Tur” Professional World Cup! On behalf of all involved in these events, I express my gratitude to Igor Mazurenko! The representative office of PAL will organize certified rating tournaments and armfights on the territory of Russia, provide information support to athletes, organizers, as well as conduct educational events. In addition to the final negotiations and the signing of the contract, Igor Mazurenko conducted a large seminar on armwrestling, in which more than 40 people took part. Vitaly Laletin will join the TOP 8.